5508 Features: -Easy-to-clean 18/10 stainless-steel interior helps prevent foods from sticking and will not react with foods.-Pure aluminum core covers bottom of the pan and extends up the sides for greater heat conductivity.-Signature stay-cool handles are cast from solid stainless-steel and designed for ergonomic comfort.-Suited for all stovetops including electric, gas, ceramic, induction and halogen.-Made in the USA.-Capacity: 8 Quarts.-Oven safe up to 350° F.-Dishwasher safe. Construction: -3-Ply bonded construction for a lifetime of use.-Materials: 3-Ply bonded construction: 18/10 stainless steel interior and exterior, pure aluminum inner layer. Color/Finish: -Mirror-finished magnetic stainless-steel exterior is hand-polished to a lustrous shine. Warranty: -Lifetime Warranty.-For cleaning, care, use and warranty information, please click here. New shipped in non-retail carton with warranty. 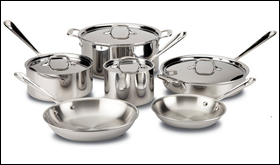 Capital Cookware Is an Authorized All-clad Dealer.